Arithmetic with mixed numbers and unlike fractions can seem overwhelming to students, especially those who lack confidence in fraction conversions. Strengthen your lessons and give your students the help they need to understand this new concept with these resources that allow a student to work with peers or individually. Struggling students can get extra help with these equivalent fractions resources. 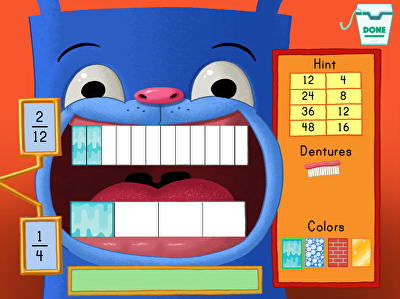 Kids use the tape diagram model to practice adding and subtracting fractions in this game. Adding and subtracting mixed numbers can be daunting, but this worksheet helps by breaking the process down step by step. Assess your students’ knowledge of important fifth grade fraction concepts! Use this printable to help your child learn how to add fractions with unlike denominators. Understanding measuring cups is easy when you can work with fractions, and cookies! This colorful math worksheet will jog your child's memory through the steps to complete mixed fraction addition! 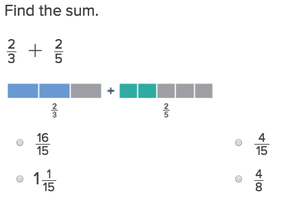 Adding Fractions with Unlike Denominators will help students practice this key fifth grade skill. Try our free exercises to build knowledge and confidence. Fractions can be challenging when taught in an abstract way. That’s why this unit invites learners to engage with fractions and mixed numbers in very visual and concrete ways using number lines, tape diagrams and area models. Students will learn different strategies to practice identifying and generating equivalent fractions. Assess fifth grade fraction concepts, including equivalent fractions, adding with unlike denominators, improper fractions, and mixed numbers. 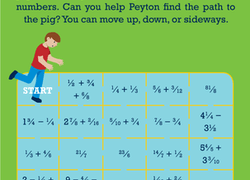 Kids tackle various fraction concepts in this math worksheet. Use these cards to help students compare two strategies that involve finding common denominators. Does your child need extra math practice? This worksheet can help her with the steps to adding mixed fractions with unlike denominators. Your child will learn how to master fraction word problems with this clear and simple worksheet. Challenge your child with a math maze that will practice addition, subtraction, multiplication, division, and fractions! What fraction of the pie do you want? 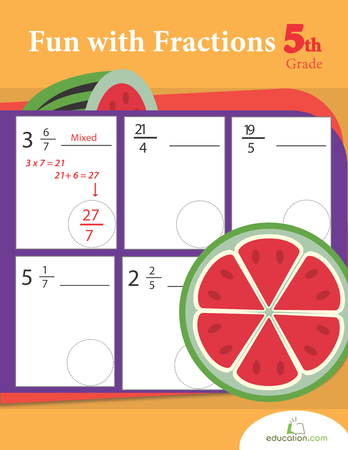 This tasty math worksheet will help your student familiarize with fractions. Show students how to add fractions concretely with fraction strips! 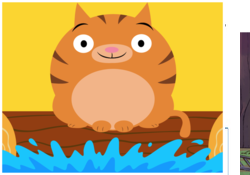 Use this glossary with the EL Support Lesson: Explaining Fraction Addition. Use these vocabulary cards with the EL Support Lesson: Explaining Fraction Addition. Does your child need extra math practice? 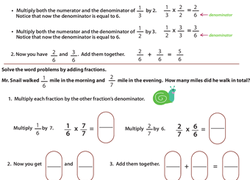 This worksheet can help him with the steps to solving mixed fractions addition problems. Do you find adding fractions frightening? You certainly won't after using this practice worksheet! Do some pumpkin patch math with your child this fall. See if you can find the tricky pattern that weaves through this pumpkin patch math worksheet. When denominators differ, upper-elementary students may need a little extra help and practice adding fractions. To helps students learn how to add fractions with different denominators, these worksheets and activities break the addition process down into step-by-step instructions. Worksheets with sample problems help students develop strategies for fractions with different denominators. 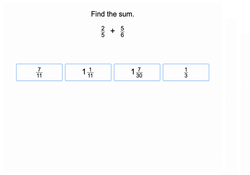 Start by finding a common denominator with third graders, and then as students learn, you can introduce adding and subtracting mixed numbers that include fractions with different denominators. Sample problems walk through converting a mixed number to an improper fraction and then converting back to a mixed number. Real world problems, such as working with measuring cups, teach students how adding fractions with different denominators can help with everyday activities. Resources, including multiple worksheets for third to fifth graders, provide a variety of methods to teach adding fractions with different denominators. After addition, subtracting fractions should be easier for students.